No kidding, this giveaway is really fab. I'm not just saying this because I'm guessing. I'm saying this because I know. 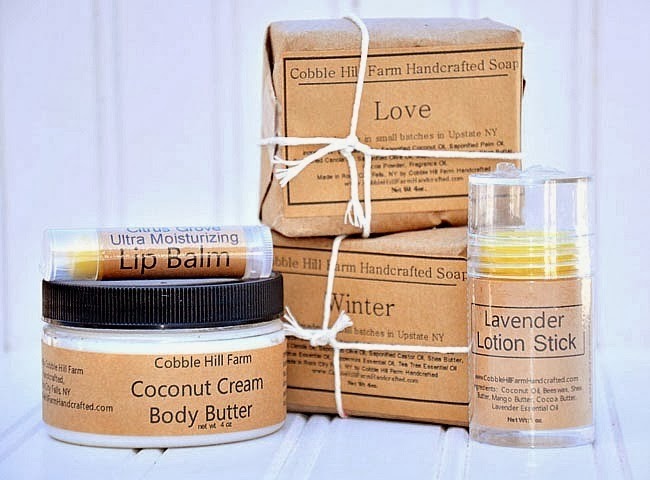 Cobble Hill Farm products are top notch and my family uses many of their products daily. I would recommend their products tenfold. 1 - 4oz jar of Coconut Cream Body Butter, 1 - 1oz tube of Lavender Lotion Stick, 1 Citrus Grove Ultra Moisturizing Lip Balm, 2 soaps - Love and Winter. Great giveaway! I'd love to win!!!! This stuff looks amazing! I would LOVE to win this! Looks great, would love this! I'd love to try their products since my daughter has so many skin issues and we use natural products only on her. i would love to win! i love giveaways! nice to find a new fun blog! enter me too! Someone will be very blessed. looks good! Please enter me! Such wonderful products and someone will be very lucky to win this giveaway! Hope you and Staci get a good response from this giveaway! Please enter me. Love cobble creek farm! I would love some pampering this winter:) Thanks for the opportunity. Please enter me would love to try the products. Love your pictures! I would love to win this! The products sound quite lovely.